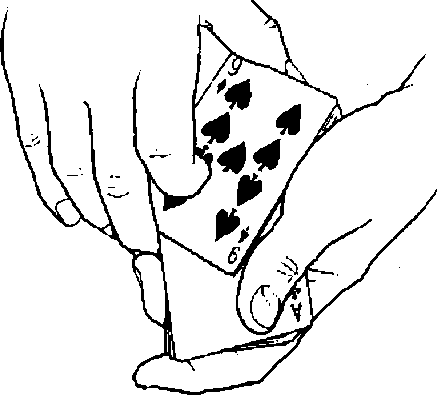 People often ash me how I learned to do the things 1 do tuith cards. I usually put them off with comments about years of practice and dedication But I can see you're too intelligent to fall for that. So ITl tell you the truth. When J was a child, one night a mysterioits stranger appeared to me. He had horns, a pointy tail, cloven hooves, and smelled of brimstone. He told me that, in return for my immortal soul, he would grant me complete control over playing cards. Well, even as a child, I hrwto a good deal u>hen I heard one, So I said, "Sure." But, before I signed in blood on the dotted line., I got him to agree to a loophole. On the day of reckoning he and 1 would i>lay a card game of his choosing. If I won, he would have to tear up the marker. This setu|> worked great for years. But the day finally came twhen the mysterious stranger appeared again and said, "Darwin, it s time for our little game. Well use these cards from the tarot deck, sometimes called the Devils picture hook. Jf you f>ich any one of these aces of coins, Darwin, you 11 be free to continue pursuing your nefarious lifestyle. "Oh, I almost forgot," he said. "We need one more card, my favorite tarot card It's called the DeviL Not a bad Jtheness, is it?" he said. I liked the odds. If I picked any one of thi aces, Yd beat the raf>. I just had to avoid the one Deinl card. The stranger mixed the cards and I made my choice. Darwin," he said, "get ready to relocate to a warmer climate. And let this be a lesson, to you, Damm" he said. The Devil never, ¿tier ¿>lays fair."